-Yelp teamed up with production company Hungry Man for its first-ever ad campaign, featuring Ben Sinclair of High Maintenance (video above). -The New York Times invites ad buyers to its Page One editorial meetings. 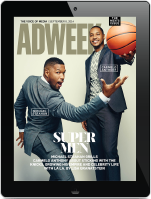 -Snapchat is debuting ten second video ads, charging advertisers two cents per view. -Google claims only 54 percent of online ads are viewable. -The National Guard has paid $5.3 million to 11 different NFL teams over the past three years to honor veterans on Jumbotron screens.